Started in 2014, the Casino features an assortment of thrilling slots and games from NetEnt, Microgaming, iSoftBet, among other developers. The Casino is owned and run by Betchain Limited Casinos and regulated by the government by Curacao. Playing at the Casino is certainly a once in a life-time experience. 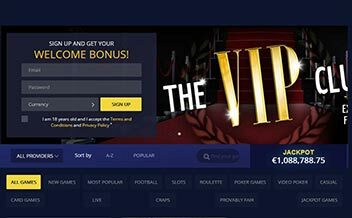 The Casino offers a variety of online Casino games, has an E-wallet payment option that is convenient, and is available on instant play and mobile devices. 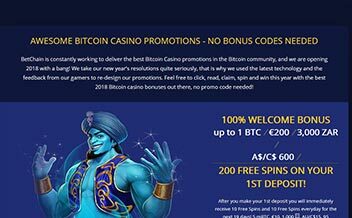 Just like other Casino’s BetChain Casino offers both new players and existing ones a hoard of bonuses and promotions that are aimed at keeping them enticed and playing. 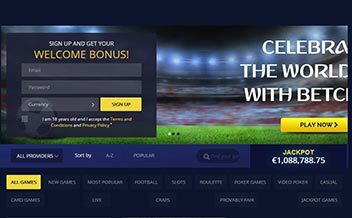 The welcome bonus features 100% match up to 1 bitcoin/€200 on the first deposit as well as 75% match up to 0.5 bitcoin/€500. The third deposit attracts 50% match up to 0.5 bitcoin/€500 and the fourth one 75% match up to 3.75 bitcoin/€1500. 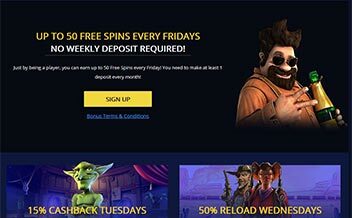 New players also get up to 200 free spins which are awarded on batches of 10 and 20 every day. The Casino also offers numerous promotions in the form of cash backs and deposit bonuses. BetChain Casino has one of the richest collections of slot games in the modern-day online Casino gaming world. Some of the games include Crazy Starter, Fruit Zen, Sushi, Aztec Magic, Lucky Blue, and Gypsy Rose slots. Table game fans also have a piece of the grand cake. The games are tailored to meet the diverse needs of the vast client base. Some of the games include Blackjack variants, Roulette variants, Baccarat variants, among others. The Casino offers players a numerous amount of video poker game offerings. Some of the popular titles include Deuces Wild, Jacks or Better, Trey Poker, Wild Texas, and various others. The Casino is powered by some of the most sought-after software developers in the vast online Casino gaming world. Some of the developers include Booming Games, Pragmatic Play, NetEnt, Microgaming, Ezugi, iSoftBet, Betsoft, Amatic Industries, GameArt, Mr. Slotty, Pocketdice, and various others. The software also holds a Certificate of Trust. The United Kingdom, the United States, Italy, the Netherlands, Spain, Israel, and France. Master Card, Visa, Neteller, Paysafe Card, Maestro, QIWI, Mobile Commerce, Skrill, Yandex Money, EcoPayz, and several others. US dollars, Canadian dollars, Swedish Kronor, Euros, Australian dollars, Norwegian Kroner, Russian rubles, South African Rand, Bitcoin, Bitcoin Cash, Litecoin. BetChain is a completely instant play online Casino which means that players can enjoy their favorite online Casino games from the comfort of their homes without having to download additional files. The Casino also runs on major web browsers like Internet Explorer, Chrome, and Mozilla. BetChain Casino has a wide range of thrilling slots and games from software developing giants like NetEnt and Microgaming. The Casino also has a convenient E-wallet withdrawal option as well as an honored Certificate of Trust.